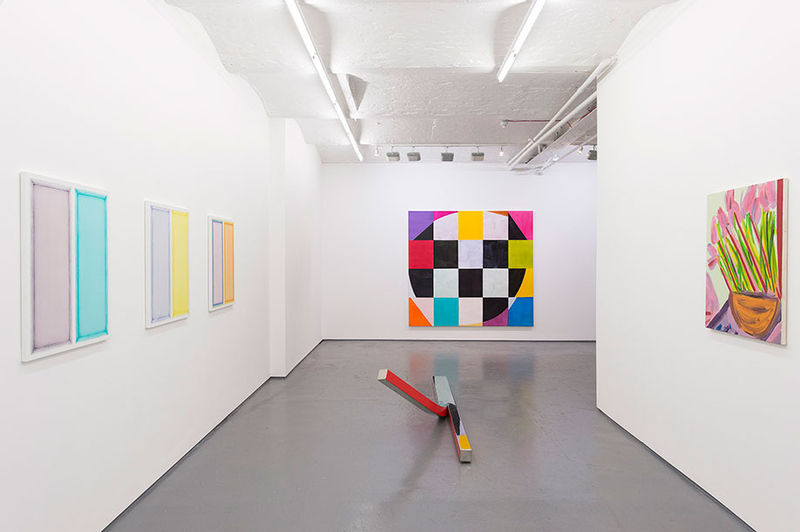 Dominic Beattie creates a pulsating, immediately mesmerizing atmosphere within the space of the current show, Kaleidoscope, at Fold Gallery, intuitively positioning the independent components in a visual loop. The work within this loop feels submerged, yet synchronized, establishing a striking synthesis of movement and colour. The system that Mali Morris employs within this synchronization has a casual authority. Second Stradella (2016) carries an underlying perception of weight, as found in a painter like Ellsworth Kelly, combined with the natural fluidity and syncopation of works such as June Red and Black (1965) by Terry Frost. Thinking back to Kelly’s show at the Guggenheim in New York, I am captivated by Morris’s composition, which is activated by the 20-rectangle structure. This painting, although frontal in its composition, has the ability to draw the viewer back into the space. The choppy brush strokes within the bone-black rectangles draw the eye, as the gestures are relaxed but incisive. Here the visual depth feels like a pea-souper smog, conjuring up the burning of soft coal and the tanyards intensity of 1950s London. Different, unexpected, happenings within each rectangle trigger an originality and uniqueness. For example, the bottom left-hand cadmium orange triangle is capped off at the top. This knocks the symmetry off-kilter; the viewer wants to bring their own expectations to the Stradella, but Morris plays with that formal unfolding to create a link between past and present. Julian Wild’s sculptures always feel on the move. In Peeled (2013), it seems as if the work has unpeeled itself and skidded across the space, picking up the reflections of other works. We are held in the sculpture’s placement, its physical solidification, the moment of that split – the point of conversion of one thing into another. Perhaps a found object, torn apart by the maker, and the inside colour revealed. I like the way Wild flattens out that emotional energy, transforming the physical actions into a metaphorical disclosure. The second sculpture is equally enigmatic. The knotted, broken geometry of Himalayan Balsam allows the sculpture to read like a twisted body, performing a repeated action. Selma Parlour’s haunted paintings hover with retinal disparity across the space. The luminous synchronicity, in this case, operates through our intrusion into a private world, where a parallel dimension may exist. The colour shifts in the multiple framing of each composition are exact, and build a system that is modulated through the tonal colour bleeds. In One for each eye 4, each successive colour – cobalt violet, manganese blue, viridian green and brown /ochre – alter the perception of the retinal spatialisation. Here the space between the eyes, which allows binocular vision (the angle from which each eye views an object) creates the imperfect match with its counterpart, a yellow multi-toned field of colour. These paintings are shimmering, intense objects, and their emptiness allows the other works in the space to breathe. Patterns of activity are encapsulated in the two Bridget Riley prints. The artist Michael Kidner said: “It is the area between the second and third dimension which interests me – the order which lies between imagination and reality”. I understand that idea with Riley; I very much liked her show at the National Gallery – I felt very clearly that that kind of space, particularly with the wall paintings, contained, in-between, something of a strange place. In this exhibition, About Lilac feels just as powerful in its colour registration. The lilac floats on the green ground, sitting behind the eye-popping dusty red. Martin Maloney’s Studio Flowers # 47 has the whimsical, animated quality of a Raoul Dufy painting. The transparency is painted in an extremely physical manner, which Maloney makes look easy and spontaneous. Each mark is purposeful, natural and energetic, constructing the still life, and becoming lost in the rhythms of the paint. James Alec Hardy’s 160804 holds the key to the visual puzzle in the space. At first glance we are seduced not only by the structural repetition playing on the monitors, but by the plugs and wiring that wrap around them. The interplay between the symbolic colour shifts suggests something of Man Ray’s revolving door paintings, with their clarity of colour overlaps. But Hardy introduces another element – the sculptural metamorphosis of the screens themselves, allowing the whole shape to become another form. The edgy and organic structure which unfolds in the work of Dominic Kennedy feels partly intuitive; a sensuous experience arrived at through the drawn approach. The quality of line has a particular nervous energy that gives the work a palpable tension as it interacts with the more consistent elements of the painting’s structural decisions. For example, the felt border feels important to the way in which the compositional tension is built. The soft yellow material creates a sensual counterpoint to the obscuring of forms, which are often both revealed and concealed. This rhythmic drawing calls to mind the dexterity of Andre Masson, particularly in Vegetal Delirium (1925). The system is in the materiality that Kennedy has evolved, such as crayon, oil stick, pencil and oil paint. Different levels of touch are used in a performative manner. I like the way the bottom left-hand corner has sculptural weight; its transparent whites make it difficult to decipher the broken and distorted brush marks. The speed of the painting’s beginning, and its sense of indecision and nervous energy, dictates the pace. The swan form in the corner pulls into the space and adds a cool lyricism to the interpretation. This exhibition increases our understanding of colour mechanisms, and their visual articulation. It allows us to understand retinal and perceptual representation through its creation of a continually changing sense of reflection and symmetry, while giving equal weight to human fallibility.